He’s set the all-time rushing record at Kentucky, been part of UK’s first 10-win football season in 41 years and earned All-American honors. If that’s not enough, he’s also had his own autograph tour to give Kentucky football fans one more chance to be with him. “He is on another level of happiness,” said April Snell, Benny Snell’s mother. “He is living what you have to call a dream. All the years he has put into what he does and to go through a season like this and get recognized as a team and individual for what you have accomplished, it’s just great. The icing on the cake for all that is that he’s also healthy. No injuries at all. 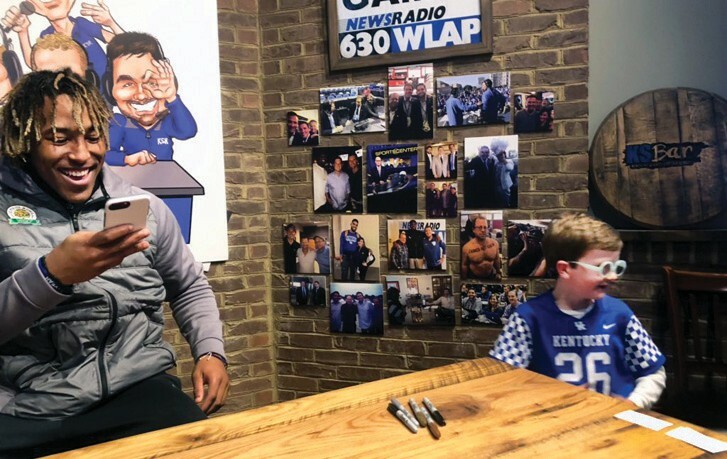 Snell has left a legacy at Kentucky that few players can because of the way he connected with fans similar to what Randall Cobb and a few others have done in recent years. Matt Walter of Danville took his three children — ages 11, 8 and 7 — to Snell’s autograph session at KSBar & Grille in Lexington. He went a day early to get a ticket to assure they would have a spot in line and his son, who wore a Snell jersey most of football season, came with a “SnellYeah” tattoo drawn on his stomach like the player has. Snell pulled out his cell phone and took a picture with the seven year-old fan before he autographed a football that Townsend Walter already had signed by Josh Allen at Fan Day. “I have been to autograph signings where players just went through the motions and you could tell they were there to make money. Benny took time with every single person there. He was telling his handlers not to take pictures with their phones but to use the fans’ phones so they would have a keepsake,” Matt Walter said. His mother totally agrees and couldn’t be happier that he got to have an autograph tour to connect with fans. Jemarl Baker Sr. has not made the trip from California to Kentucky to see his son, redshirt freshman Jemarl Baker, play since the preseason Blue-White Game. However, he’s making the trip to Lexington January 26 to see the Cats host Kansas. “We are very excited about that game for sure,” Baker Sr. said. That excitement elevated when his son finally got healthy enough to play. He did not play in the first eight games after the knee issue that forced him to redshirt flared up. However, he’s now not only playing, but impressing coach John Calipari with his overall play that has proven he’s more than just a shooter. “All he wants to do is win,” Baker’s father said. “That’s the way he was raised. He gets just as much enjoyment out of a pass or defense as he does scoring. He just plays. If you need him to score, he’ll score. He will give you ball movement if you need that. If you need him to shut down a player, he can do whatever. His struggle to overcome his high school knee injury led the family to wondering at times if he would ever be able to play again. Still, Baker Sr. knows he could face one major problem when he comes to the UK-Kansas game. He’s not on the disabled list but you won’t see WKYT-TV videographer Steve Moss at Kentucky basketball games for the next few weeks. He tore the MCL (medial collateral ligament) in his knee during a sideline collision with UK receiver Lynn Bowden and Herald- Leader photographer Alex Slitz during UK’s win at the Citrus Bowl. Moss got hit one play after Lonnie Johnson’s interception put UK in position for Benny Snell’s touchdown run that broke the school rushing record. Bowden caught a pass and Moss saw him head line for the sideline where he was. Moss backed up but a Penn State player pushed Bowden after he was out of bounds. Bowden hit Slitz and the Herald photographer rolled into Moss with both going down. “It was just a fluke. No play is worth hanging in there to the last second and potentially getting hurt. I had backed up,” Moss, who had been hit covering football only one other time (at a high school game) in his 30 plus years with WKYT . Moss said Bowden posted a message on Twitter apologizing — just like he did with Fish. Junior second baseman Alex Martens has become an exceptional player for coach Rachel Lawson, but she also is making an impact on the program in another way — via social media with her photography. “A lot of parents want to see their kids when they are at camps on social media. I don’t know why, but it is a big thing apparently,” Lawson said. “I have an i-Pad and just hand it to her (Martens). She takes pictures, puts them on social media. I have no idea what is going on. I am just quite and boring. Then all of a sudden I would get calls and text messages from across the country about what we were doing on social media. I had to go online to check. Kentucky freshman guard Ashton Hagans had at least three steals in five straight games – something no UK player had done since at least the 1996-97 season – going into UK’s game at Georgia. 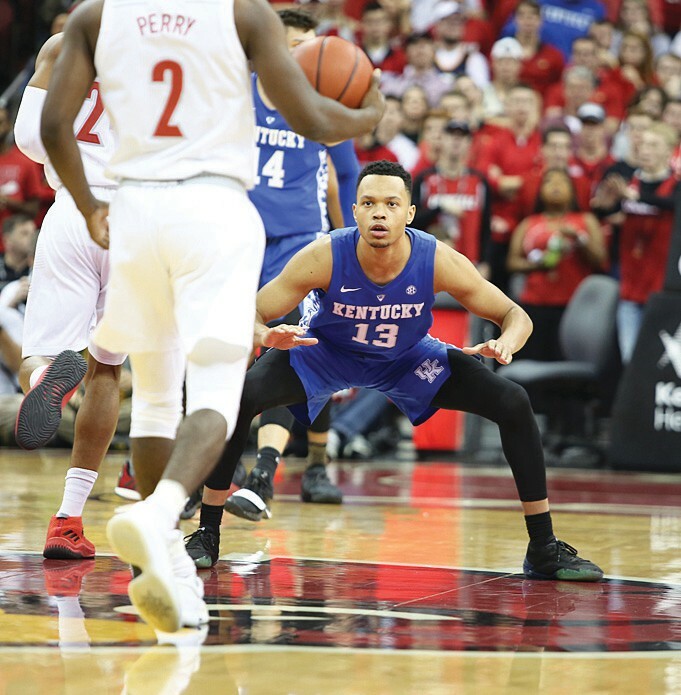 Kentucky coach John Calipari insists he wants Hagans – a 47 percent shooter from the field and 80 percent shooter at the foul line – to shoot more. However, the coach knows Hagans’s strength is defense. “Shooting is not his forte but he’s capable. What he does is he breaks open games with those steals,” Calipari said. Hagans has 22 steals in the last five games and could put his name into the UK record book if he continues his theft rate. Rajon Rondo has the one-year mark with 87 steals while Wayne Turner had 79, Rodrick Rhodes 76 and Cliff Hawkins 74. Guess who is No. 5 on the steals list? It’s Kyle Macy with 69. Macy was known for his shooting and floor leadership and certainly did have the speed of Hagans. However, his on-court instincts made him a deceptive defender. But Hagans could be elite defensively based on what he’s done.